Most long running television shows tend to end up becoming pale imitations of what made them popular in the first place. Scripts stop being as interesting and characters start to become predictable and boring as they descend into catch phrases and cliche. However, there are exceptions, and viewers need look no further than the Blu-ray package Midsomer Murders Set 25 from Acorn Media to find one of the best current examples. Set in the fictional English county of Midsomer, the show has not only successfully weathered a changes in its lead character and supporting cast since it first aired in 1997, but has continued to be entertaining and intelligent after all this time. As a police procedural one would think they’d have a hard time coming up with new plots, but this set includes the show’s 100th hour and a half long episode, and they don’t seem to be running out of new ideas anytime soon. 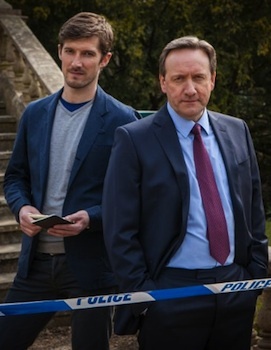 One major change this time round is Detective Chief Inspector (DCI) John Barnaby (Neil Dudgeon) has a new side kick, Detective Sargent (DS) Charlie Nelson, played by Gwilym Lee. The second change is Barnaby’s wife Sarah (Fiona Dolman) is very pregnant. This allows the show to interject periodic breaks into the murder investigations, with scenes of the Barnaby’s domestic life as comic relief. What’s nice is while they are almost all expectant baby related, they don’t tend to fall into the typical “sit-com” stuff we normally see on television. The three disc Blu-ray set contains five feature length episodes, three special feature mini documentaries and a couple of still photo galleries. The special features tend to overlap, excerpts from an interview with Lee and from the piece about the 100th episode both end up in the “behind the scenes” featurette. While they’re all enjoyable, they do tend to become a bit redundant after a while – watch the first two and pass on the last and you won’t really miss much. However, it’s not the special features you should be buying this for anyway. It’s the continuing amazing high quality of the shows. The acting, the scripts, and the direction are all of the high standards we’ve come to expect from watching Midsomer Murders in the past. As Nelson, Lee fits in to the ensemble easily. From his stumbling new beginning moments as he gets to know his new boss and what’s expected of him in the opening episode, The Christmas Haunting, to his feeling comfortable enough to take his own initiative in the second episode, Let Us Prey (Yes that’s the correct spelling, so you might be able to guess the episode has something to do with a church). What’s great about this series, is while you’re pretty much guaranteed a couple of pretty gruesome deaths during the course of each episode, the show is something a family can sit down and watch together without any worries. 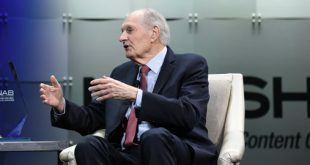 Those deaths that take place on screen are not overtly graphic – although one in Let Us Prey is a bit grisly – and the scene of the crime shots don’t dwell more than necessary on the gorier aspects of an incident. Still, there’s enough action to keep younger audience members interested and plenty of intelligent dialogue and twisty plots for the more adult minds. Then, there’s the show’s sense of humour. Perhaps I’ve a slightly twisted bent to my humour, but comments like “Cause of death a large sharp object pushed through him tearing some essential organs” by the pathologist when observing a corpse which has been impaled by a cast iron lighting fixture are funny. Alright, it doesn’t sound particularly rib tickling out of context, but the combination of the line’s dry delivery and the subtle reactions of both Barnaby and Nelson made it priceless. This set, as mentioned, includes the show’s 100th episode. There have been plenty of these landmark type episodes in other series, and unfortunately a lot of them fall flat. The usual problem is other shows go for the cheap sentimentality by bringing back old characters or other cliched plot devices. In The Killings of Copenhagen, the creators of Midsomer Murders have done something much smarter. Instead of deviating from their usual structure, they’ve simply added some special elements. First and foremost is the inclusion of a foreign location, Denmark, and two police officers from that country’s police force. When a British subject is found dead in a Copenhagen hotel room and Danish police ascertain the murder had its origins in Midsomer County, they contact Barnaby and Nelson to investigate the English angle. When a second body, the brother of the first corpse, also shows up in Denmark, the British detectives travel to Copenhagen. The dynamic between the two Danish detectives, both female, and the Brits adds a new and fun dimension to the interplay between Nelson and Barnaby. The second is, of course, the impending birth of baby Barnaby. With Sarah expecting to deliver at any moment, travelling off to Denmark has left DCI Barnaby a little on edge. While this is sort of your typical television husband being more nervous than the wife about an impending birth, there aren’t many husbands who will have the foresight to give their wives the name of the best police pursuit driver under their command if she needs a quick ride to the hospital. Midsomer Murders is one of those delightful shows which, while not necessarily improving with age, shows none of the signs of degradation one usually associates with long running programs. “Set 25” not only integrates a new character into the mix with pleasing results, it proves the show’s creators are still committed to producing a police procedural of the highest quality, while maintaing the human element which makes it so popular.